Thanks to all of you who have made time to come out and wave signs already. Quentin needs his friends to rally together once more this coming Friday, to make a big showing for Saturday's primary election. Please join us at the intersection of Pali Hwy and Auloa Rd at 4 pm! The campaign is going great, and with our help, Quentin is definitely going to win the House seat for Kailua-Lanikai-Waimanalo. The sign waving starts at 4 pm on Friday, September 19th, although Quentin is usually there by 3:30, if you want to start early. 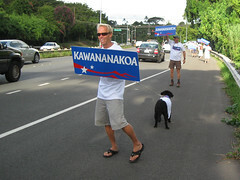 The intersection is located at the bottom of the Pali Highway, between Kapaa Quarry Road and Castle Hospital. After the sign waving there will be a party at the house of a supporter nearby, close to triangle park. For anyone who is free, Quentin will also be out there this Wednesday at the same time. But if you can only make one day this week, please come Friday, since they need a big turnout for that one. Thanks again to everyone who has already helped out! You guys are making a big difference to the campaign. Latest campaign news: Quentin was named the likely winner of this contest in a recent analysis segment on KGMB news. Right on guys! So far we have me, Reaper, Bob, Brazilian Ray and Nightshift. That's a great start - can anyone else spare a little time Friday afternoon? It would sure be a big help to Quentin. I will definitely make it, but it will be around 4:30. You guys ROCK. Quentin is lucky to have such helpful friends. I'll be there at 3:30, hopefully after with a quick flight and a tasty refreshment under my belt - see you there! Bob notes that it seems like quite a showery day, so folks might want to bring rain gear, or at least a change of clothes. Apparently we get more votes for doing it in the rain, so let's cross our fingers for some serious squalls over Maunawili today. I will be there after 4 pm. No skirt this day.